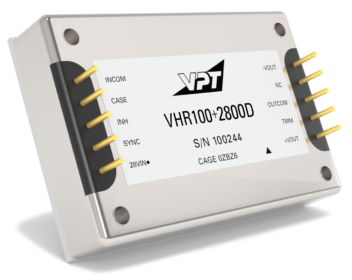 VHR100+2800D DC-DC Converter | VPT, Inc. Ideal for non flight-critical solutions in military, avionics, unmanned systems as well as manufacturing equipment and controls. For complete specifications, please see the official datasheet. To provide you with the most accurate data for the actual performance of this product once deployed, please note that the electrical performance data provided below is at Tcase = -55° C to 125° C, Vin= +28V +-5%, full load, unless otherwise specified.